This exhibition brings together a diverse selection of paintings by the artist David Bent. It includes geometric landscapes, intricate photographic collages, and paintings which tackle major contemporary social issues. 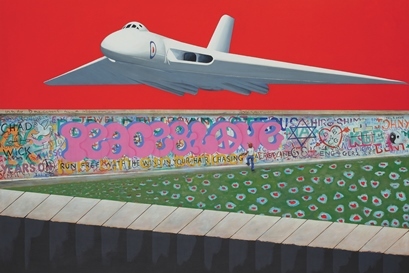 Bent is rightly well known for his ‘art of flight’ paintings and prints, which have been described as “transforming aviation art” and led to Bent being awarded Honorary Companionship of the Royal Aeronautical Society. The exhibition will include examples of his bold and engaging aviation art. The exhibition also includes elements of his series “Movement 2000”, which explores the major social challenges facing the world at the start of the third millennium. Bent’s art combines dramatic and inventive compositions, a bold use of colour, and a passion for the subject. This exhibition is an opportunity to explore more work by this fascinating Swindon-based artist. Please note that Swindon Museum and Art Gallery is open Tuesday to Saturday, 11.00am to 4.30pm. Please check our website for more details on exhibitions and events.